FRAMEABLE: Each 5×7 note card can be set inside a 5×7 frame for a beautiful, framed photograph for a counter, desk or wall. WEARABLE: The matching handmade Pendant is a beautiful present to be worn. It includes a 24″ link chain which can be shortened. HANGABLE: The matching handmade Ornament is a beautiful ornament for the Christmas Holiday or just to be hung in a special place in a home or office. The swirled Ornament hanger is 2″ long. USEABLE: The matching handmade Keyring is a beautiful complement to the card to be used and seen every day. GIVEABLE: The matched gift of the beautiful photograph with your choice of a Pendant, Ornament, Keyring or a combination of either 2 gifts is the perfect gift that shows that “The thought is always there.” Give that something special and different to someone. 1. Select the perfect Photo Note Card. 2. 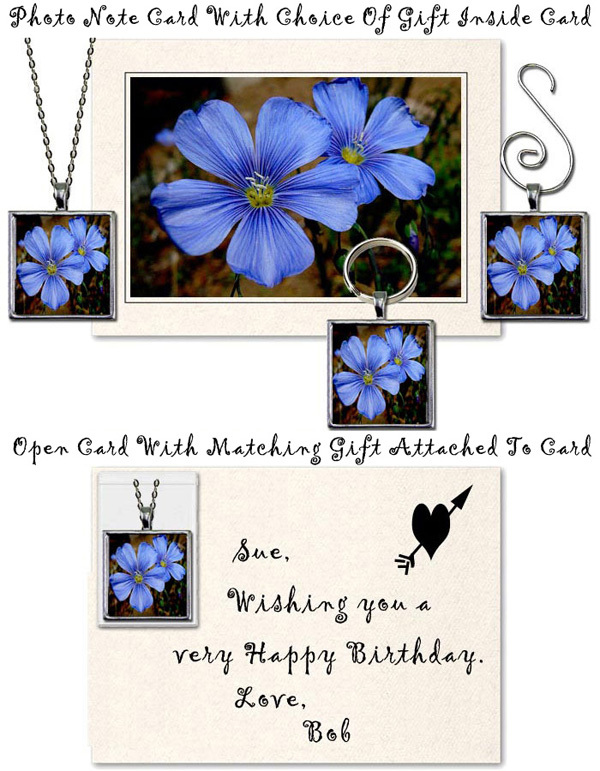 Select the perfect matching gift (Pendant, Ornament, Keyring or a combination of 2 gifts). 3. Open the note card and write your special message. 4. Mail (hand stamped) or hand deliver your note card gift. Click Here For Outdoor Eyes SIGNATURE COLLECTION.